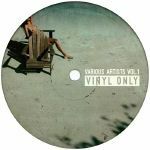 Review: Vinyl Only reach their seventh release with a fresh grip of lesser known producers bringing high grade grooves to the table. Bubbadog opens the 12" up in a woozy fashion with the warbling piano chords of "Goin' Round", capturing a time-slip mood that carries through to the dusty jazz soaked beat down of Minus The Majors' "Strole On Through". On the B-side, Alex Zuiev gets into an exotic, chiming, 80s-inflected mood on "Down By The River", creating a slow-burning dancefloor heater out of classic ingredients. Ugly Frankie finishes the EP off with the stripped down funk of "Your Ears Look Great".